Submitted by TonyYates on Mon, 04/08/2014 - 11:30.
he 32nd DWAC Annual Rally is due to be held in Hengelo (Gelderland) from Thursday 28th through to Sunday 31st August 2014. There is still time to book your place at this classic microcar event, which is being organised by our Dutch friends this year, in the Province of Gelderland, on the eastern side of the country. The all-in cost of the event, for Adults, is € 55,00 per person (€ 57,50 if paying using PayPal) plus a € 10,00 supplement when registering and/or paying after the 1st August. Submitted by TonyYates on Sun, 03/08/2014 - 17:09. 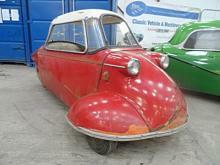 Visit http://www.national-microcar-rally.co.uk/ for all of the latest news and further information. Submitted by TonyYates on Fri, 30/05/2014 - 10:26. Submitted by TonyYates on Sun, 23/03/2014 - 18:54. Submitted by TonyYates on Wed, 12/02/2014 - 11:23.
he list of Micro-car and related Events for 2014 has been published (click on Diary link above). This early list for 2014 has been provided by Alan Hitchcock but by his own admission, is incomplete and some of the entries are a bit vague. There are a few are long running annual events that we anticipate but for which we have not yet received details, others are one-offs for which the organisation is still being worked out. We will update the list from time to time as the year progresses. Obviously if you are involved in organising any events that would interest MEC members then please let us know (email takeoff@messerschmittclub.org or send to Mark, Tony or Alan). Submitted by TonyYates on Wed, 01/01/2014 - 19:23.
nother Year and what better than getting it off to a good start with our traditional post-Christmas 'NOSH'! We are aiming to gather at the ‘Ye Olde Leathern Bottel' Lewknor again (on the borders of Oxfordshire and Buckinghamshire) at lunchtime, on Sunday 12th January 2014. For newcomers, finding your way there could not be easier! Look for Junction 6 of the M40, at the foot of the Chilterns and head towards Watlington on the B4009 (that's heading left after leaving the motorway, coming from London, or right, coming from Birmingham). The first turning on the right after leaving the motorway, takes you into the village of Lewknor and to the door of the ‘Ye Olde Leathern Bottel'. Try and arrange to arrive at around about opening time (12 noon) to have the best choice from the pub's excellent menu and a comfortable seat (http://www.theleathernbottle.co.uk)! If you need more details, contact Tony Yates (Honorary Secretary) at mec.mail@virgin.net, or if you get lost on the day, 'phone Tony on 07973 448 023 or the pub on 01844 351482. Submitted by TonyYates on Sat, 19/10/2013 - 16:22.
ur AGM will be held on Saturday 16 November 2013 at the Inn for all Seasons, on the A40, just to the west of Burford (see http://www.innforallseasons.com/). We will meet at lunchtime (from 12:30 or sooner if you can make it) with the intention of having a fairly informal get together, taking any Reports and electing a Committee to see us through next year. Hopefully we will have some good news concerning TAKE-OFF and can agree a subscription for 2014 having decided at our last AGM, to skip it again this current year. If you wish to join the Committee and help in any capacity, especially with the web-site and magazine, please let our Chairman, Tony, have your seconded nomination as soon as possible. All are welcome and the more the merrier! If you wish to attend the meeting it will be helpful if you could let Tony know at least a week beforehand, so he can ensure we will all have somewhere to sit at the Inn for all Seasons. It is fairly roomy so there should be plenty of space for us on a quiet Saturday! Submitted by TonyYates on Wed, 07/08/2013 - 12:06.
ollowing on from the successful NMCR Stand at the Classic Motor Show in 2012, the NMCR Fund Administrators have recently heard that they have been offered a 52.5 sq. metre stand in Hall 12 Stand No.12-900 at this year's show. Also, the Heinkel/Trojan Club and the Isetta Owners' Club have adjoining stands in Hall 12 too – so micro cars will be well represented this year. Jenny Dilks, Grant Kearney, & Grenville Taylor (NMCR Fund Administrators). Submitted by TonyYates on Wed, 07/08/2013 - 12:00.
he 39th National MicroCar Rally Review meeting will be held on Sunday 27th October 2013 in Pinxton Village Hall, Kirkstead Road, Pinxton Derbyshire NG16 6NA at 1.15 pm to discuss this year's rally and plan for next year's rally. Tea/coffee and biscuits will be available. Everyone is welcome to attend – further details contact Ray & Jenny on 01773 782688 or 07712 654777. The Hall will be open at 12.30pm. 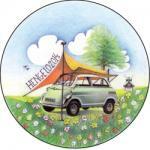 Submitted by TonyYates on Wed, 17/04/2013 - 11:43.
t the end of August, this year's National Microcar Rally will be taking place at the Three Counties Showground, Malvern, Worcestershire and we have received the advance programme from the NMCR Administrators. Thursday 29th August: Campsite opens 12.00. A visit to the Morgan Motor Company has been pencilled in for 14.30pm. If you wish to visit the Morgan factory YOU MUST BOOK WITH MORGAN DIRECT a.s.a.p. on 01684 573 104. The cost is £12.50 per head. Teme Hall (on site) will be available in the evening for a get together. Bring your own drinks.